Application: The very popular 7-1/4" Alumi-Cut blade for non-ferrous metal.Also works in plastic. TENRYU'S best value for your non-ferrous metal cutting needs. Thin Kerf. Very Economical The Alumi-Cut Series offers true quality and affordability. 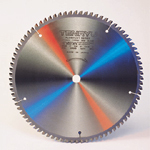 These blades are available in a wide variety of sizes to fit most popular job site and shop saws. Excellent results in aluminum, copper, brass, bronze and other non-ferrous metals. Even works well in many plastics. Also good for woodworking and plastic cutting when needed. Resharpenable for long life, the Alumi-Cut blades will help you improve your bottom line! These blades are also an excellent choice for cutting laminated flooring (i.e. : PergoR, etc.) with slide-miters or table saws.